If you want/need to remove an affiliate from an existing transaction you can easily do this from your transactions area in your ThriveCart dashboard. When removing an affiliate from an existing transaction, you will have the option to leave any earned commissions associated with the affiliate or clawback/remove commissions. When an affiliate is removed from a transaction, no future commissions will be paid to that affiliate and their relationship with the customer will be removed for that specific transaction. To remove an affiliate from a transaction, head over to your transactions area, search for the transaction you want to edit and click the pencil icon next to the affiliate ID. You’ll then be present with a modal window with the affiliate name, ID and the option to remove the affiliate. 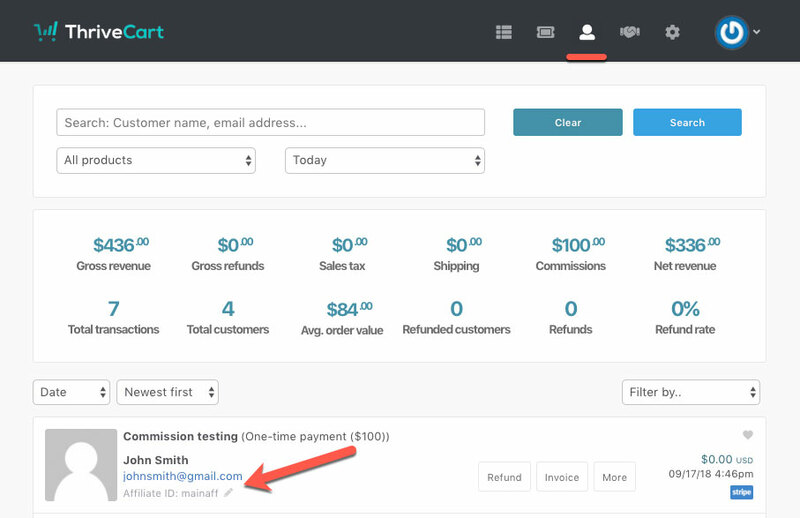 Clicking the button to remove the affiliate will then give you the option to remove any earned and queued up commissions, or initiate a clawback on any previously paid commissions (through the system via PayPal). If you don’t want to remove any previously earned/paid commissions. You can deselect the checkbox. The system will also give you a breakdown on how much commission would be cancelled/clawed back. Once you’ve clicked the Remove affiliate button and confirmed you want to remove the affiliate, you’ll get a confirmation message and now the transaction will not have an affiliate associated with the transaction. If you have any questions or need any help with the above, please feel free to contact the support team directly.